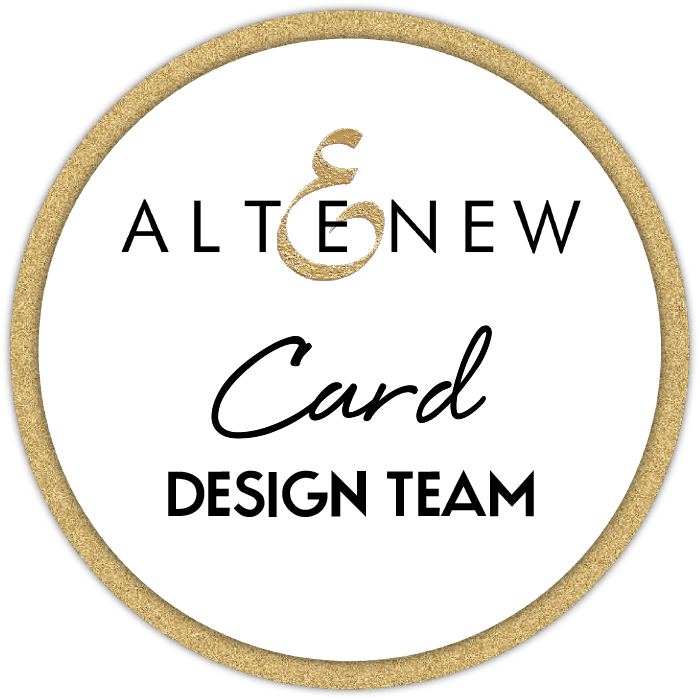 Good Friends at Purple Onion Designs (video)! I decided to film as I created so you can watch it if you like. Other Supplies: Prismacolor Pencils – White, Spanish Orange, Orange, Lemon Yellow, Cream, Chartreuse, Limepeel, Olive Green, Light Aqua, Peacock Blue, Peach, Pink, Magenta, Parma Violet, Lilac, Cool Grey 50%, Warm Grey 20%, French Grey 50%. < Previous Time for a new Challenge at Scrapbook Boutique Bloghop & Giveaway! Next > Friends at Muse! What a beautiful card! Lovely coloring, and I love that cute little Willa! Beautiful card Therese, love the flower centres and how you did the bits of glitter. Just finished the card off perfectly. Beautiful. Like how you punched the twine and the tip to get the angle right. Thanks. LOVE it such a very sweet card..stunning coloring too! 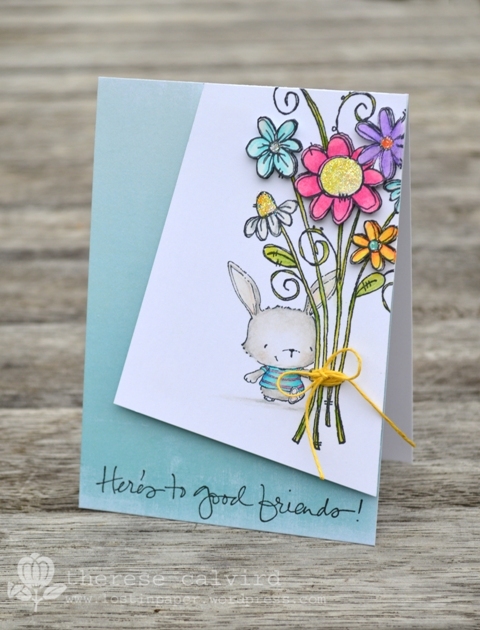 Your card is beautiful and really enjoyed watching you colour on your video. You do it so perfectly, I’m very envious. And the bunny is simply adorable. Perfection! I am simply flabbergasted by how darling and cute and well done this card is!! Seriously, I smiled with pure delight at the beauty that is just oozing from it!! Thank you for making and sharing this amazingness with the blog world!! Little ‘Willa’ looks so adorable holding that huge bouquet of flowers! 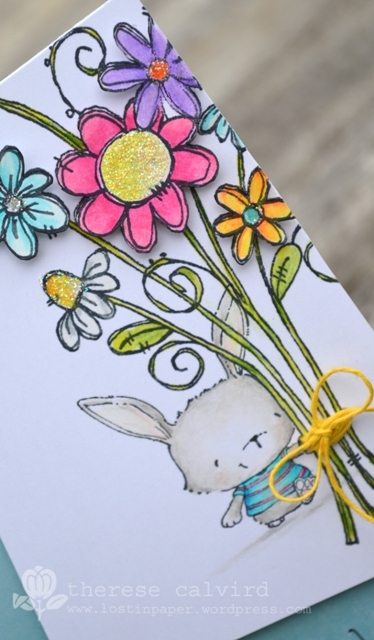 Love how you colored everything on this card, Therese…it’s so pretty! Very pretty! I like how you popped up some of the flowers and added sparkles! Ha! I’m the same – using patterned paper is a big event! 🙂 Love that sweet little guy and the gorgeous flowers!